Green ledger paper comes in varying numbers of columns to meet your specific recordkeeping needs. 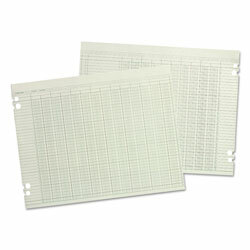 Sheets are also prepunched and ready to insert into your record book or binder. Sheet Size: 9 1/4" x 11 7/8"; Form Type: Accounting; Format: Loose Sheet; Number of Holes Punched: 4. INNER PACKAGING: 100 per pack. Dimensions: 9 1/4" x 11 7/8"
Green Tax and Accounting Forms from Wilson Jones! 103 In Stock today.